I’ve been sitting on this post for almost seven months. I didn’t want to write about it at the time, and I really just wanted to put it all behind me. I’ve had a lot of time to reflect on the experience, and I can now see things in a much more positive light, so I’ve decided to share my (our) story. It’s kind of long. You may want a snack. “You should be prepared for a possible C-section.” Apparently, while she was examining my (ahem) cervix my doctor noticed that I have a tight pelvis, which is quite common among competitive runners and other athletes. These two bits of news did not settle well with me. We were quickly moved in for an ultrasound, and I nervously chatted with the doctor on duty to get some more information. I wanted to know what determined if the baby was considered “too small”, and really were they going to send me to the hospital RIGHT NOW if that were the case? I was sort of freaking out while she was taking the measurements. There wasn’t much that I could do at that point, and I had no idea what all of the lines and numbers meant. I think I closed my eyes and held my breath for most of it. 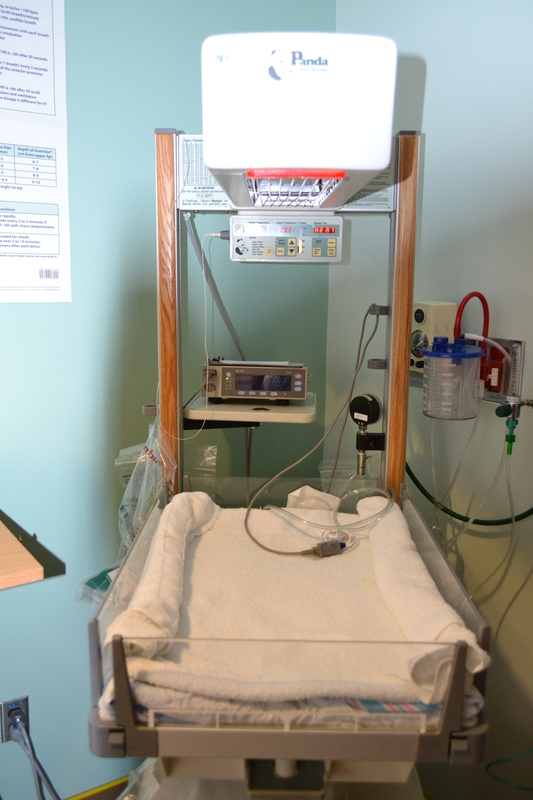 “We’re measuring 6 lbs 10 ounces which puts you in the 12th percentile. You just made it.” Apparently 10th percentile is considered too small, so we just squeaked by. We walked back across the hall with our results to see my doctor again. She was smiling, which relaxed me a bit until I was interrupted by a nurse handing me a pamphlet. “Here is all you need to know about induction.” She had scribbled 8/28 8pm on the back along with number for the hospital. “If they don’t call you before 8pm, make sure you call them before you leave for the hospital. That is, unless you go into labor beforehand.” I was instructed to call and make sure they had a bed available. I was also told that the process could take several days, and that sometimes it doesn’t work at all and you’re either told to go home or sent in for a C-section. We called our family and let them know the details. I was reeling from the events of the past hour, but thankful to be headed home with an extra week to maybe go into labor on my own. My doctor had explained that with my slightly elevated blood pressure, the standard of care was to induce at 39 weeks, but since I was otherwise healthy, and the baby was fine, she was “gifting” me another week. Obviously I was not thrilled about being induced at all, since I was hoping for the chance of an unmedicated birth, but I wanted what was best for the baby. I think my family was happy since they had to travel from NY and this gave them time to plan ahead and be there for the whole thing. Followed by two days of this. I felt like I was handling it well, although I did finally break down on the morning of the 30th because I just couldn’t deal with the waiting game any longer. My whole family was staying at my house and doing their best to keep me in good spirits, but I knew they had to leave in a few days. 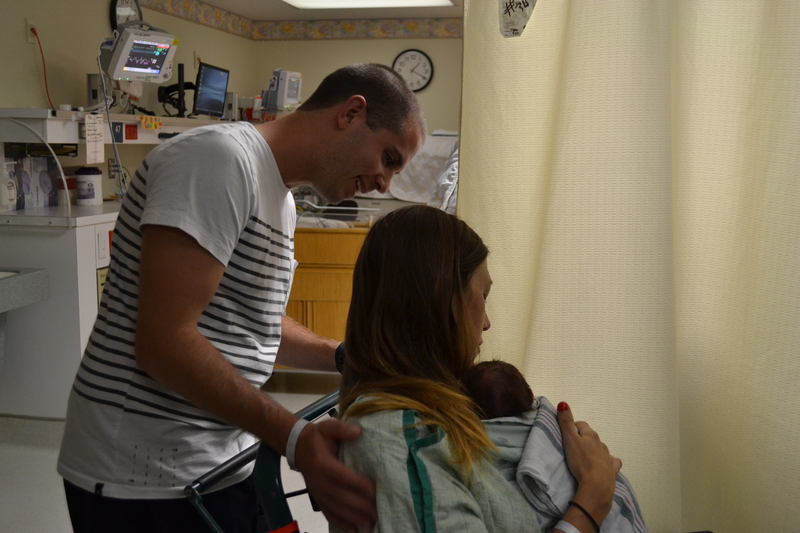 Pete was able to talk to the charge nurse who said that things had settled down (no more women giving birth in the hallway), and that we would definitely be able to come in that afternoon. I went for a walk and then before I knew it, we got the call to come in! Walking into the hospital to have a baby when you’re not actually in labor is the strangest thing. All along I had pictured my arrival at the hospital to be just like you see in the movies and on TV… screaming, in agony, someone wheeling you around in a wheelchair, water breaking in the hallway, you get the idea. In reality, we parked our car, walked inside, took the elevator upstairs, walked to the front desk to check in, and then sat on a bench for 15 minutes staring at the wall. A nurse eventually came and brought us to our room. It took about two hours of talking to various doctors, nurses, and medical students before we could finally get things rolling. It started with something called a CRB (Cervical Ripening Balloon), which is basically a “balloon” that gets inflated with a saline solution and manually dilates your cervix. 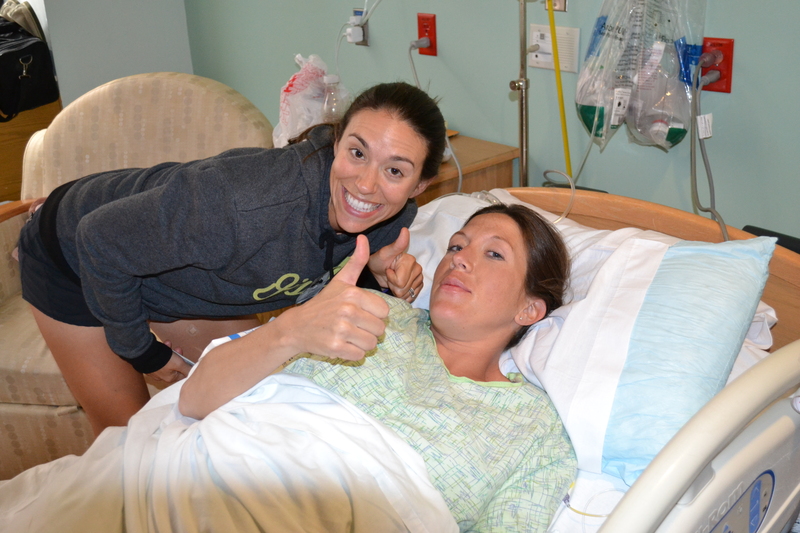 Before they put the CRB in, I was asked if I would like to get an epidural. Dear God, I thought that this portion of labor was going to be the easy part. I brought books and games to keep myself busy for 12 hours. It can’t be that bad, I thought. Putting it in was a little uncomfortable, but I did my breathing exercises and held Pete’s hand, and we got through it. Once they started to inflate it, I felt even more uncomfortable but still okay. Then they were done. I made it, phew. 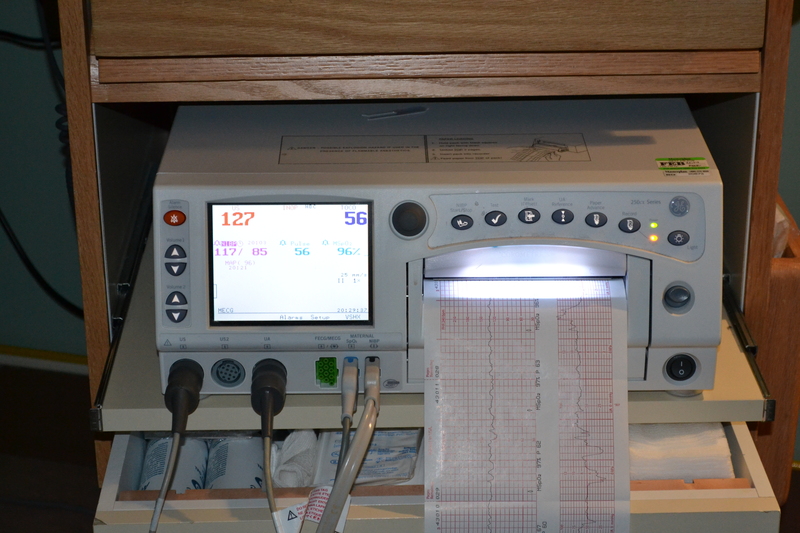 Then the first contraction came. I breathed through it. But there was almost no break before the next one came. They were two minutes apart from the beginning of one contraction to the beginning of the next, and building intensity. I told Pete I needed an epidural already. I was in agony. He called the nurse, and they explained my options. I settled on a dose of Nubane which would last at least a few hours and then we could talk it over and decide what to do next. It felt like forever until the nurse came back with the Nubane. I was squeezing Pete’s hand and writhing in pain as they gave me the medicine, but I didn’t feel any relief. “When am I going to feel it?” I asked. “Just relax and let it work,” the nurse told me. Relax? It’s not working. It took awhile for it to kick in, but eventually the drug did relax me. I still felt pain from the contractions but it helped a little. 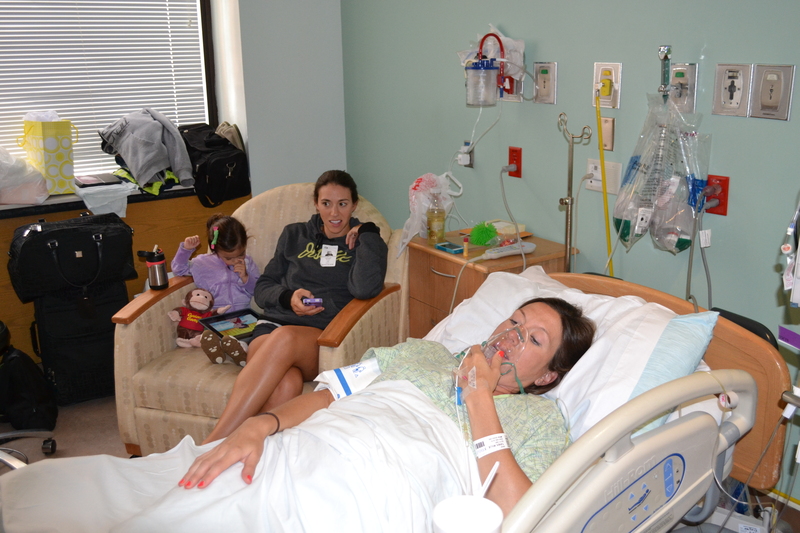 I had to breathe through an oxygen mask to make sure the baby was getting enough oxygen. 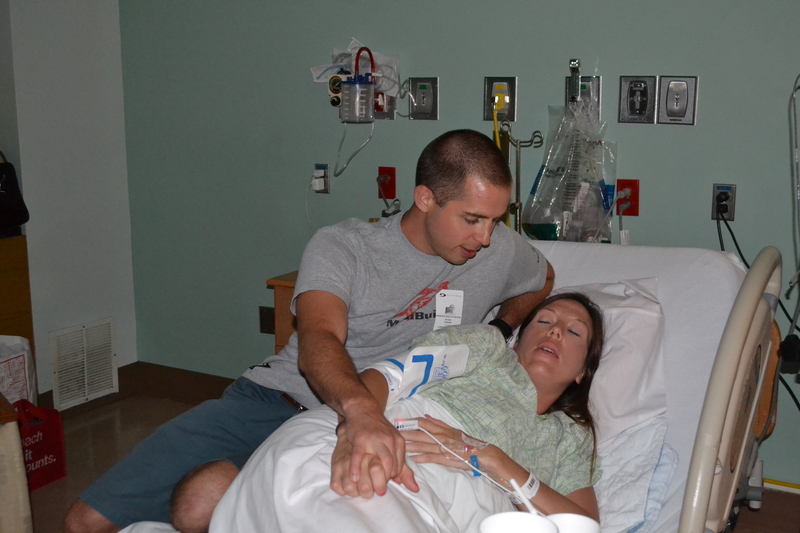 I remembered I had brought a koosh ball to squeeze during the contractions so I could give Pete’s hand a break. Then my family arrived, which helped keep me entertained for awhile. The zig zags are contractions. My family loved watching the monitor and telling me, “You’re having another contraction!” Um, I know. Eventually they left to go to sleep. I tried to sleep, but I had a blood pressure cuff taking a reading every 30 minutes, nurses in and out frequently to check on me, and contractions every 2-3 minutes. I wasn’t completely stuck in bed, but I had to call someone to unhook me if I wanted to get up (plus I found the contractions to be worse once I got up, which was the opposite of what everyone had told me) so I mostly stayed in bed except to pee. I didn’t sleep at all, and I don’t think Pete did either. At 5am they came in to take out the CRB. I kept contracting on my own for awhile afterwards, but they were moving closer to 3 minutes apart, so the nurse came in and said they were going to start me on the lowest dose possible (a “1”). I was scared, because I had heard so many terrible things about Pitocin. The contractions picked up in frequency and strength, but they still weren’t as bad as they had been when they first put the CRB in. Pete and I watched a few early morning episodes of Full House (I have no idea why we settled on that), and laughed at the riduculous clothes and hairstyles of the early 90’s. They upped my Pitocin to a “2”, and I started to approach the pain level I had felt the night before. At about 8 am I told Pete that it was time for the epidural. 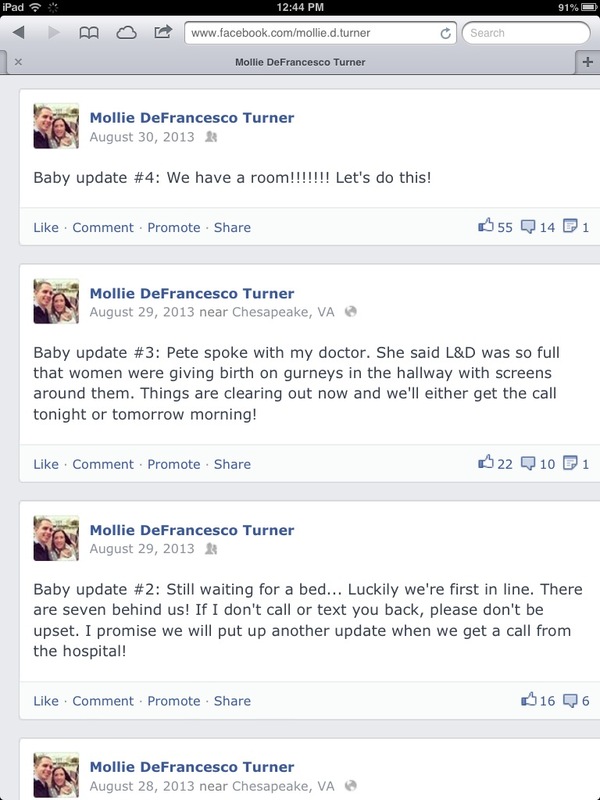 I had lasted 15 hours, but I still had a long way to go, and the contractions were getting stronger and stronger. The koosh ball and breathing were barely making a dent in the pain that I felt. Pete made a call, and nurse came by to assess how I was doing. By that point I was done. I had reached and surpassed what I had previously perceived to be a “10” on the pain scale. The anesthesiologist came quickly and I barely felt him doing the epidural. The hardest part was having to sit up, bent forward and NOT MOVE as the contractions came so that he could get the needle to go where it belonged. In a few short minutes I felt a numbness move over my body and the pain was completely gone. My family arrived, and things were progressing quickly. They upped the Pitocin to a “3”, and eventually to a “4”. By noon time they told me that I would most likely have the baby by that night. Those hours passed in a blur. We played games, talked, and watched TV. At about 7pm, I started to feel a lot of pressure all of a sudden, and I thought, something is happening. I asked my family to take a walk, so they went out to get dinner. Then the nurse came in and checked my “status”. “You’re ready to go. Time to have this baby,” she declared. Just like that, it all happened very fast. I started to feel very hot, and when the nurse came to check my temperature, she noted that it was 100-point-something. This was the first time I heard the word chorio. 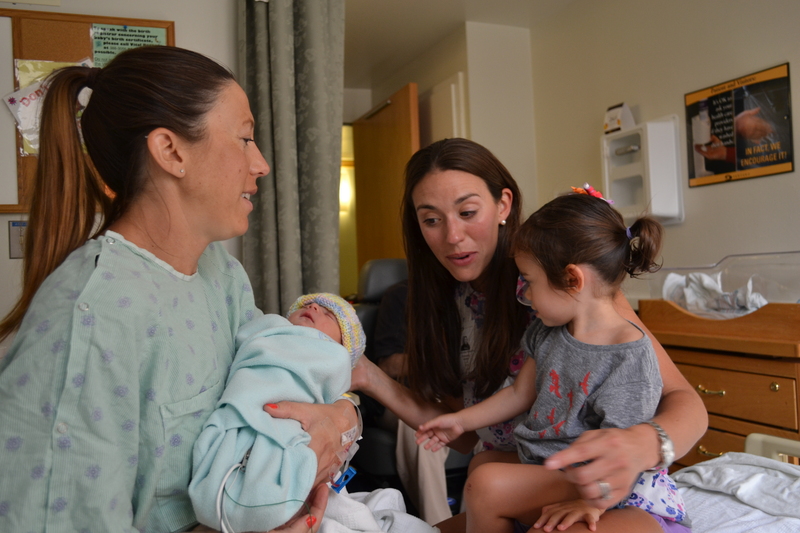 She explained that if I had a few temperature readings above 101 in the next hour, I was going to be called chorio, which was a potentially dangerous condition for the baby. At this particular hospital, that diagnosis meant that I wouldn’t be able to room with my baby, and she would have to stay in the special care nursery for 48 hours for observation. At this point I was feeling some very intense pressure and was trying to get myself ready for delivery. The nurse kept checking my temperature frequently for the next hour, and just as I was getting ready to deliver, she hit me with the chorioamnionitis diagnosis. I couldn’t do anything about it, and I had to stay focused, so I put it out of my mind. 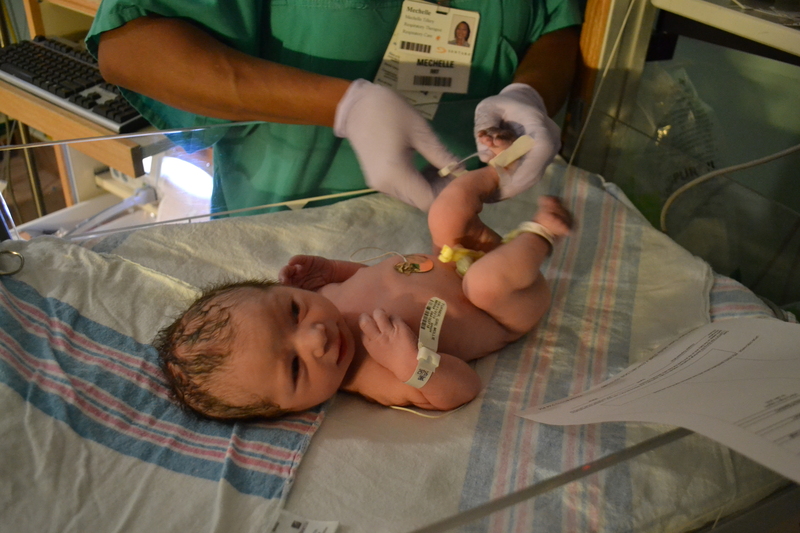 Four pushes and two contractions later, Emmaline Lily was born. 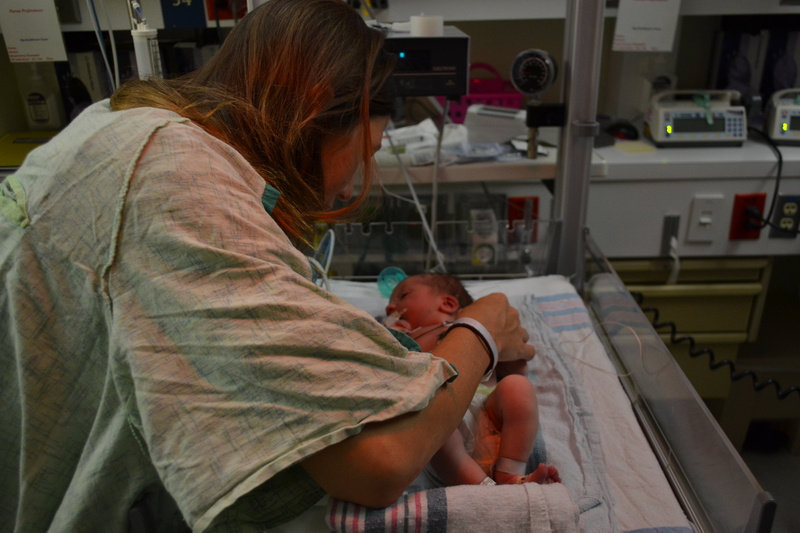 Although I wanted to have skin-to-skin time with her immediately, they had to make sure she was okay first, and I was only allowed a few minutes before they took her away for more tests. Chorio can be potentially deadly for babies, so I took this to heart and appreciated the few minutes that I had with her. And here’s where things get a little tough for me. The nurse told me that I would have to wait to see Emmaline, I can’t remember exactly how long, but I think it was three hours (enough time for the epidural to wear off). Obviously I would have preferred to be with her, but Pete was able to be with her and my sister went as well. My parents stayed with me while I watched the clock inch closer and closer to the time I was allowed to see her. 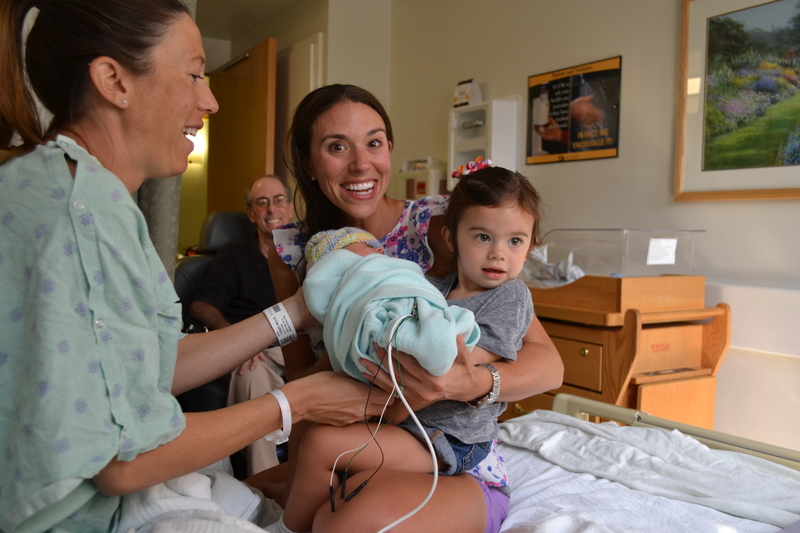 But then, a few minutes before I was supposed to go to the nursery, Emmaline’s nurse and one of the pediatricians came to my room to tell me that the labor and delivery nurse had been wrong. I was not allowed to see her for 24 hours. They were not. I broke down, exhausted, shivering from the drugs leaving my system. I tried to bury my head under the sheets, but I’m sure everyone on that hall could hear me cry. Someone went to go get Pete, and he came and comforted me. Once I calmed down a little, we decided that there must be some mistake, and that there had to be someone who could help us. Minutes later, a nurse came in to check on me. But she wasn’t a postpartum nurse. She worked in the special care nursery… and she had a wheelchair. This is where is starts to get good again. There are nice people out there, you just have to look hard to find them. 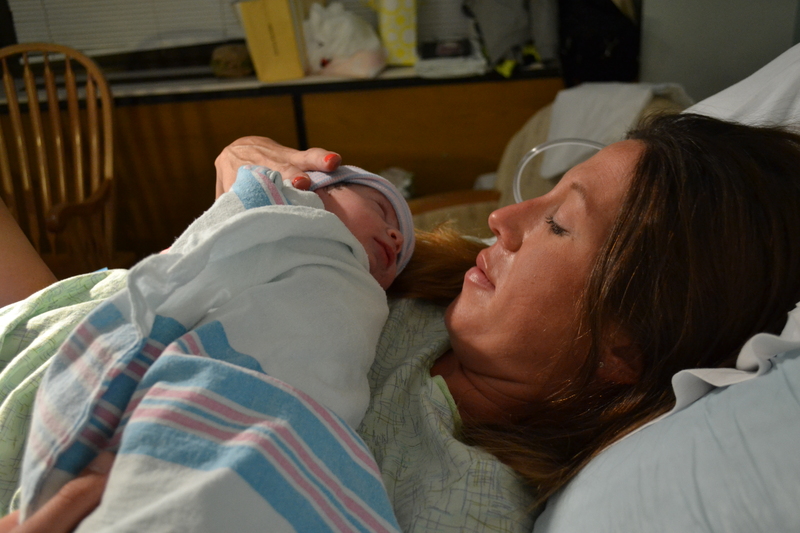 This kind soul had heard what happened, and although she wasn’t Emmaline’s nurse, she said she hates it when they try to separate moms and babies. Evidently, most hospitals do not have a 24 hour rule, and many don’t require the babies to stay in a special nursery either. So she grabbed a wheelchair and brought me to see my baby. I was smiling the biggest freaking smile of my life when she wheeled me down the hall to see Emmaline. Emmaline was a champ at breastfeeding. She nursed and I cuddled with her a bit, and then I was encouraged to go back to my room to try to rest for a bit, since she would need to eat again soon. My family went home to get some sleep, and I really did try to rest, but I couldn’t. If you’re keeping track, this was my second night without sleep. I have no idea how I was able to function for that long without sleep, but I did. The morning came, and I spent most of it in the nursery or trying to rest in my room. 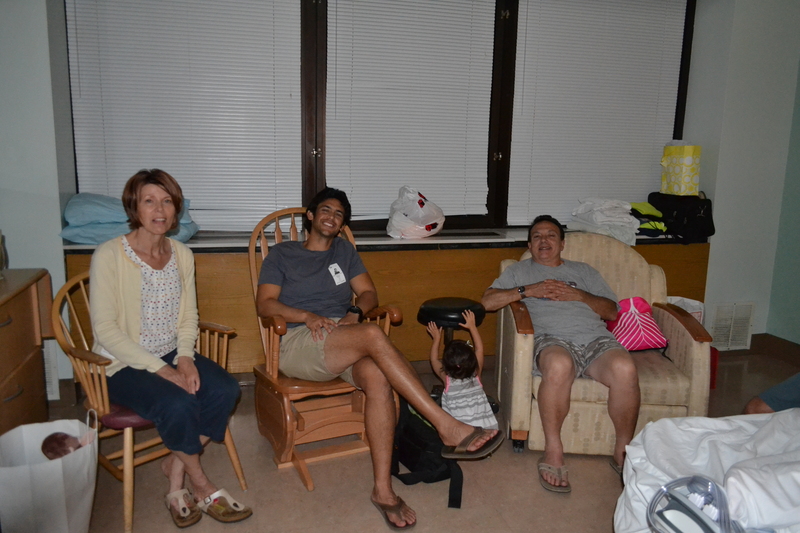 We had a lot of visitors, and it was difficult to juggle feedings and the rules about visitors in the nursery. They would only allow two visitors in the nursery at a time, and one of those had to be Pete or myself, so it took some careful choreography to let our family and friends spend some time with Emmaline. And then I thought to ask about the rules for young children, since my niece is only two. Unfortunately she was not allowed to enter the special care nursery. I felt terrible. 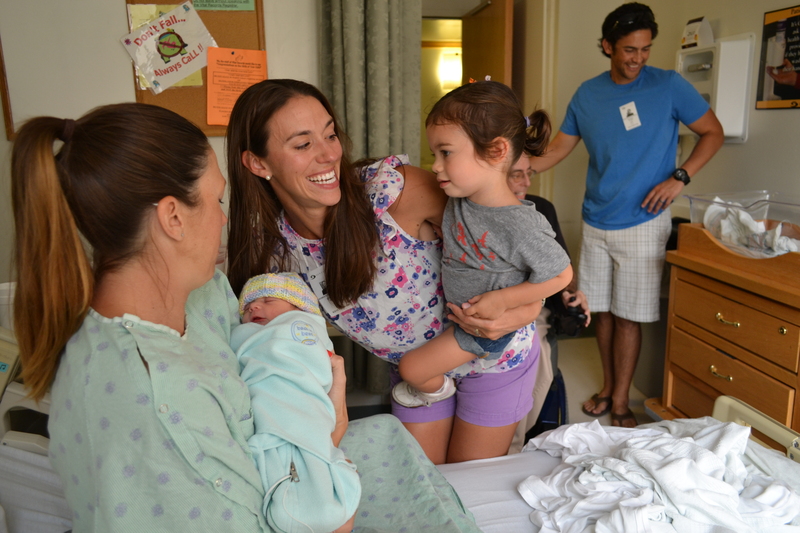 It was Mia’s birthday and she was so excited to meet her baby cousin. With the delays getting a bed at the hospital, and my long labor, my family was going to be back in NY before we were let out of the hospital. Mia wouldn’t be able to meet her cousin. In my state of sleep deprivation, I couldn’t handle telling my sister this news. I realize now that it isn’t such a big deal, but at the time I was a mess about the whole thing. Little did I know, Pete was already working a plan. I had been telling Emmaline’s nurse about her cousin Mia, and about everything that had happened. She was very nice, and she calmed me down and talked with me for awhile about it. Eventually, she told me that I should go back to my room where she had left me a snack and just relax for awhile. I got back to my room and started eating the cereal she had left for me. Then the door opened. I thought nothing of it (people were constantly coming in and out of my room) until I saw that it was Emmaline’s nurse and she was wheeling her little crib into my room! I totally cried the whole time. So Em’s nurse had called in a favor, and we got her for a whole hour. 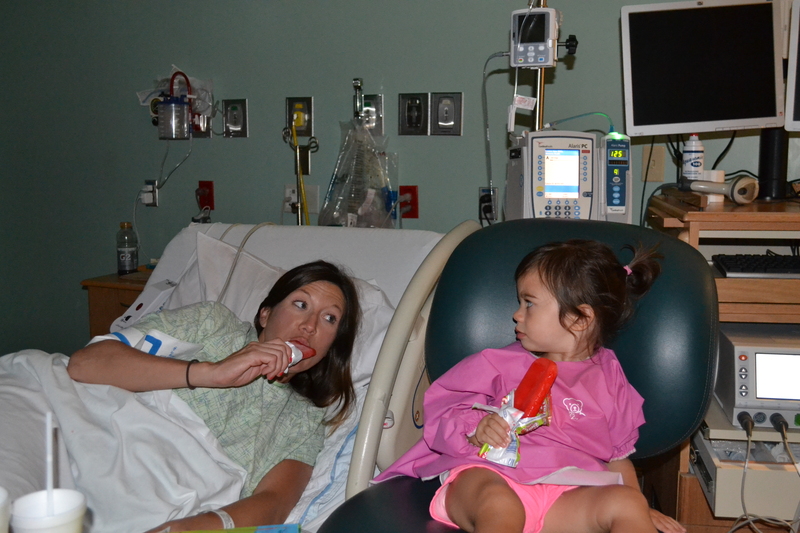 I was sad when the nurse had to take her back, but I was so very thankful for that hour. We were able to celebrate Mia’s birthday in my room (poor girl, we’ll make it up to you next year). That night I finally got a few hours of sleep. The rest of our time in the hospital passed without much drama. 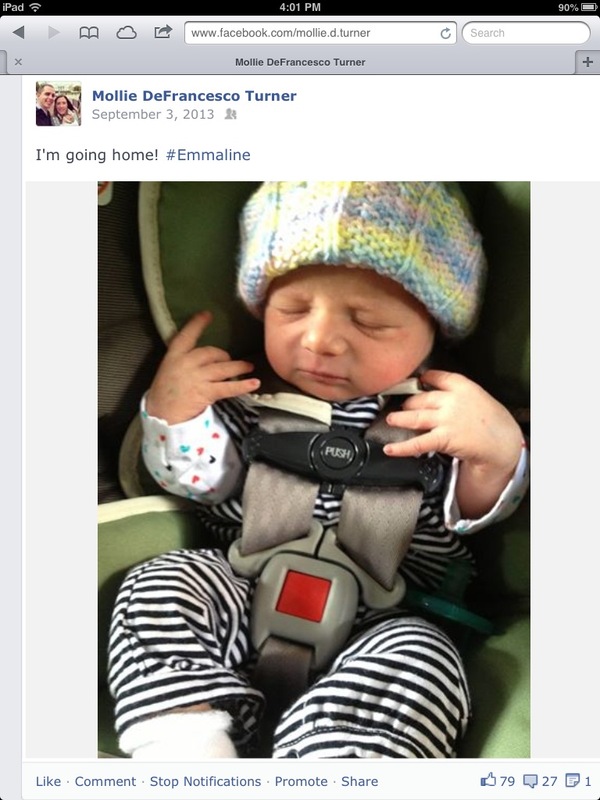 Emmaline’s labs came back negative after 48 hours, but we still had to wait for her to be released the next day. We were very lucky to get a courtesy stay (a free night) at the hospital, since I was breastfeeding around the clock and we lived 30 minutes away. The next day we got the news that we were free to go! My biggest reason for not wanting to share Emmaline’s birth story was that I was upset about the way the chorio diagnosis was made. I remember the doctors and nurses were going back and forth deciding whether or not I had it or not, and ultimately the decision was made minutes before she was born. I was also upset about the miscommunication between L&D and pediatrics over the time I was supposed to be kept away from my baby. The lack of sleep didn’t help my feelings about everything. But it didn’t take long until I got some answers. The pathology report from my placenta came back (yes, they do that) and it turned out that I did have chorioamnionitis, so the doctors had made the correct decision. I also started to think more about all of the nurses who had helped me (and had broken the rules) and made our extended stay at the hospital much better than it could have been. I also met a lot of moms, grandmas, and babies in the special care nursery who were there for much longer than a few days like Emmaline was. Some were there for weeks, and even months. I cried when the doctors did their rounds the morning they released us, not just for Emmaline but because the baby across from us was also being sent home after almost three months in the hospital. Lastly, I learned a few important things in case we ever have another baby. I still would like to try an unmedicated birth, but if I have to be induced again, I would get the epidural from the beginning. I think it would lead to a shorter labor and minimize my risk of getting chorioamnionitis again. Also, L&D nurses and all nurses in general, I have so much respect for what you do. And finally, I would never make a “birth plan” ever again. 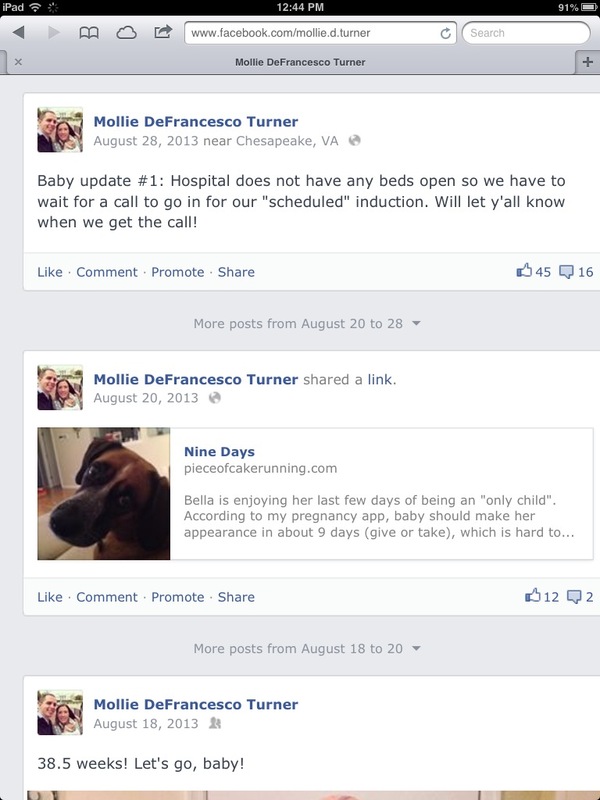 Nothing on my birth plan came to fruition, and I think that was part of the reason I was so upset. I felt like I had failed, when in truth I won because I have a beautiful, healthy baby. I rarely even think about all of this anymore, and when I do, I mostly recall the good parts of the story. If you have any questions or want to share your own experiences, go for it! Wow this was an intense read! Thank you for sharing. It’s your and Emmaline’s story, and the ending with a beautiful baby is the best!!! 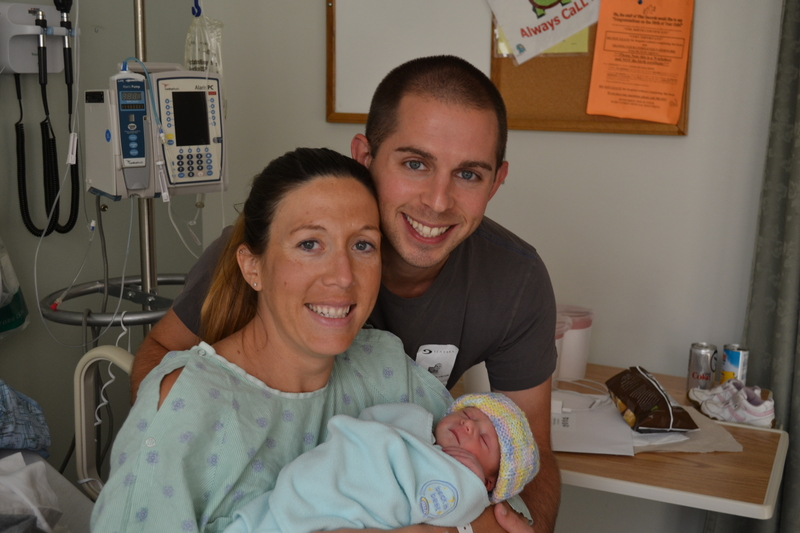 Thank you so much for sharing your birth story! And I can’t believe how much you were able to remember after seven months. Emmaline is absolutely perfect and I’m so happy for you! Thanks Hyedi! I started to remember details as I was writing, but there are still some things I’m sure I forgot. I figured it was long enough. Hope you are feeling good! What a beautiful story. You can forget some things, but pictures tell it all. You are a family now. Congratulations!!!! Aww thank you! I miss you! Oh my gosh, wow I had absolutely no idea. I was literally just glued to my screen reading this. Im sorry you went through such an ordeal a.k.a birth! I can’t imagine being separated right after and all the confusion with the diagnosis. I would’ve lost it if the hospital told me people were giving birth in the hallway! My little girl is 3 months and I wanted to do it naturally as well. I didn’t have an epidural but I was really down I couldn’t run and breastfeeding didn’t work out for me (really wish it had). Don’t sweat it over the epidural. All that matters is you had a healthy girl! I wanted to run but only made it to 6 months before I got tired of peeing behind bushes every .25 miles. 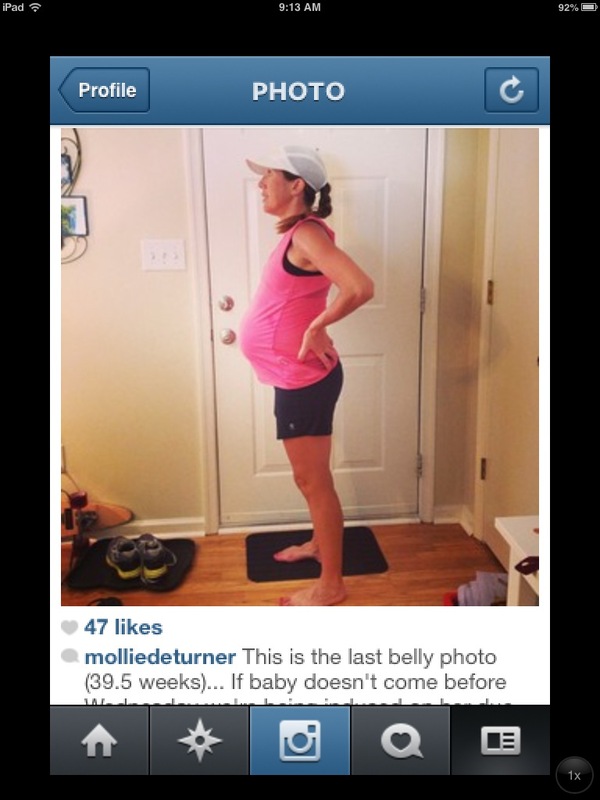 I liked checking out your blog posts and wished I could’ve kept running like you did! You’re amazing!